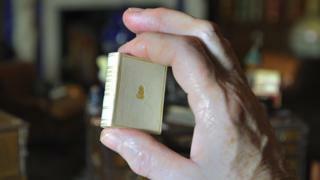 A postage stamp-sized book created for a royal dolls' house in Windsor Castle has been published for the first time. The 39 x 10mm book contains the 1,100-word story A Note of Explanation by author and poet Vita Sackville-West. It was one of 200 volumes produced in 1922 for display in the miniature library of Queen Mary's Dolls' House, but has never been published. A hardback publication of the book, sized 250 x 175 mm, went on sale on Monday. The Royal Collection Trust says it was "thrilled" the little-known work would reach a wider audience. The Queen Mary's Dolls' House was designed and built by Sir Edwin Lutyens for the wife of King George V in the early 1920s. It features books from notable authors of the age including Thomas Hardy, Rudyard Kipling and Sir Arthur Conan Doyle. However, Sackville-West's book about an ageless sprite who moves into the world's most famous dolls' house was one of handful to be written specifically for the project. Sackville-West, who died aged 70 in 1962, is known for her decade-long affair with fellow writer Virginia Woolf, as well as her literary career and designing the gardens of Sissinghurst Castle with her husband. The Royal Collection Trust said A Note of Explanation had similarities to Woolf's novel Orlando: A Biography, written four years later and for which Sackville-West was famously the inspiration for the androgynous lead character. Publisher Jacky Colliss Harvey, from the Royal Collection Trust, said Queen Mary's Dolls' House remained a "constant source of fascination for visitors to Windsor Castle". "We are thrilled that we can bring the tiny treasures of the dolls' house to a wider audience through the publication of this enchanting and original tale by one of the major figures in 20th Century literature," she added. "It's an absolute little gem and it contains something that is so characteristic of every aspect of her style. It's witty, it's stylish, it's unexpected - it's also just Vita having fun."